Flower buds and luscious green shoots usually tempt deer into gardens to browse, but during spring and times of drought, hungry deer eat most plants. Stocking your garden with shrubs, perennials and other plants deer only eat when nothing else is available provides some protection. 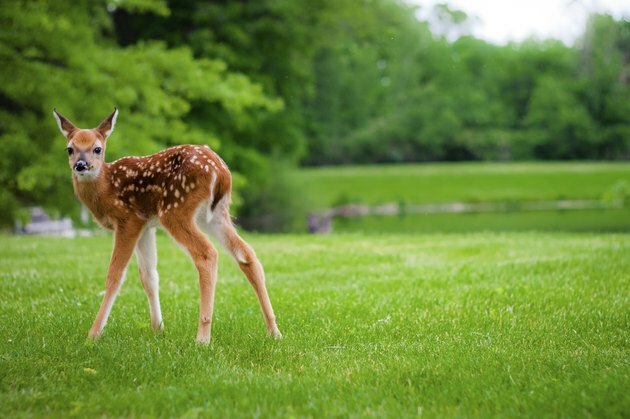 Another way to deter deer from munching your garden is to avoid applying excessive fertilizer and water because these create soft, sappy plant growth that deer love. A fawn walks across the lawn. A cluster of white flowers on a Mountain Laurel shrub. Deer-resistant evergreen shrubs provide un-chewed green backdrops in yards. 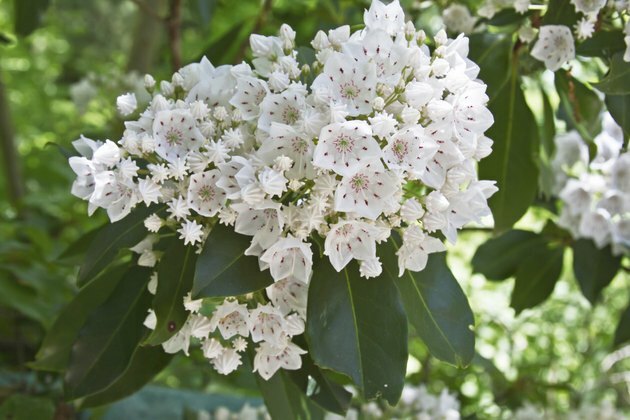 Mountain laurel (Kalmia latifolia) grows 5 to 15 feet tall and wide, and bears clusters of purple-marked rose or white flowers 6 inches wide in late spring. Hardy in U.S. Department of Agriculture plant hardiness zones 4 through 9, mountain laurel grows best in partial shade and moist, acidic soil. Chinese hibiscus (Hibiscus rosa-sinensis) is hardy in USDA zones 9 through 11 and thrives in full sun or partial shade, moist, sheltered sites. Bearing red or dark red, 4- to 8-inch-wide flowers intermittently throughout the year, Chinese hibiscus grows 4 to 10 feet tall and 5 to 8 feet wide. A red-centered pink flower blooms on a Rose of Sharon shrub. Providing seasonal color, deciduous shrubs that deer dislike add structure in gardens. 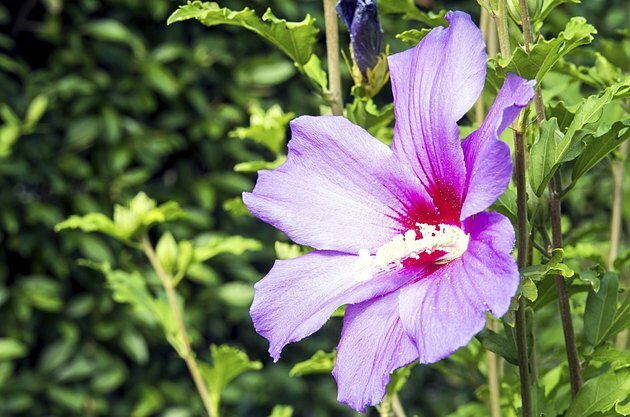 Rose of Sharon (Hibiscus syriacus), which is hardy in USDA zones 5 through 8, bears red-centered pink flowers early summer through fall and grows 8 to 12 feet tall and 6 to 10 feet wide. Tolerating drought, poor soil and summer heat and humidity, rose of Sharon is invasive in some areas of the United States. Red twig dogwood "Isanti" (Cornus sericea "Isanti") brightens winter gardens with its bright red stems and also provides fall color with leaves that turn red, orange and purple. Hardy in USDA zones 3 through 8, "Isanti" grows 4 to 5 feet tall and 4 to 7 feet wide, and grows best in moist soil in full sun or partial shade. 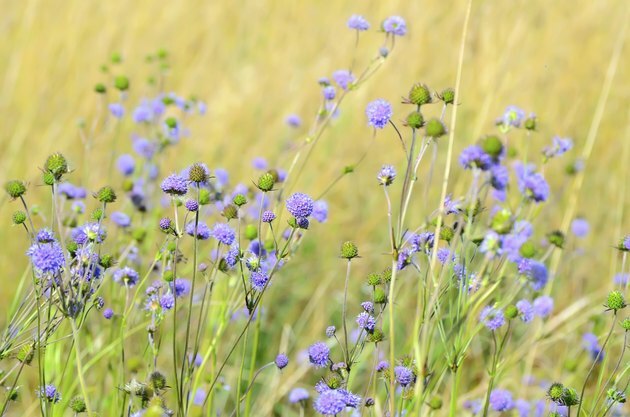 A cluster of Scabiosa Butterfly Blue grows in a field. Perennials that tolerate deer grow back after minor nibbling. Geranium Rozanne (Geranium "Gerwat" Rozanne) bears white-centered violet blue flowers above mounds of foliage 12 to 18 inches tall and 12 to 24 inches wide. Preferring moist, organic soil but tolerating average soil in full-sun or partial-shade sites, Rozanne is hardy in USDA zones 5 through 8. Pincushion flower "Butterfly Blue" (Scabiosa "Butterfly Blue") grows 12 to 18 inches tall and wide and is hardy USDA zones 5 through 9. This clump-forming perennial bears lavender-blue blooms mid-spring through fall, and thrives in full-sun sites and well-drained soil. A close-up of a white Allium Globemaster bloom. Deer-tolerant bulbs produce shoots deer dislike eating. 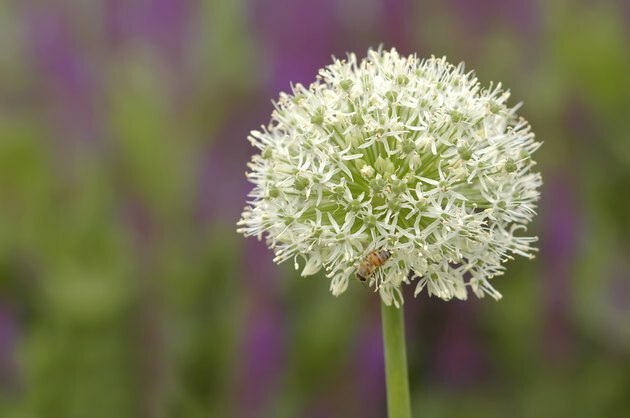 Ornamental onion "Globemaster" (Allium "Globemaster") bears large, deep lavender spherical heads of flowers at the top of long stems 20 to 30 inches tall. Growing in clumps of strap-like foliage 12 to 18 inches wide, "Globemaster" grows best in well-drained soil in full sun and is hardy in USDA zones 5 through 8. Autumn crocus "Waterlily" (Colchicum "Waterlily") grows 3 to 6 inches tall and wide, and bears lilac-pink, goblet-shaped flowers on naked stems in fall. Thriving in moist, well-drained soil in full sun or light shade, "Waterlily" is hardy in USDA zones 4 through 7.